The remains of the ancient city of Kos are scattered throughout the town of Kos and are divided into three archaeological zones: the central, the eastern and the western. In the central zone, excavations brought to light findings from the Early-christian, the Geometric and the Mycenaean Eras, which are exhibited in the Archaeological Museum of Kos, along with remarkable mosaics, many of which were used for the decoration of the Castle of Knights. Excavations also cast light upon an ancient cemetery of 77 graves of young children and infants. This zone also includes the Venetian Castle of the Knights -the most dominating construction on the island- and the Roman buildings south, where one can admire the beautiful mosaics, one of then being the famous mosaic -now exhibited in the Archaeological Museum of Kos- depicting the meeting between Aesculapius and Hippokrates. Most of the ruins of the city were excavated in the area surrounding the port shortly after a destructive earthquake in 1933. This is the eastern zone of the excavations. Among the findings are the altar of Pandemos Venus, the altar of Hercules, a Hellenistic altar in the shape of a trapezium, an arch of the 3rd or 4th century BC, surrounds by impressive columns, the Basilica in the city's orthodox cemetery (5th-6th century) and the ancient market on Ippokratous avenue, upon the ruins of which the church of Agios Constantinos is built. In the same area, one can see the beautiful churches of Agios Ioannis, Agios Georgios and Panagia Katenati. Here one can also see parts of the Hellenistic wall which surrounded the ancient city. 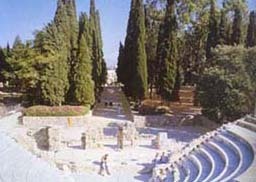 The western zone includes preserved monuments such as the temple and the altar of Dionysus, Thermes, "Afesis", in the ancient stadium opposite the church of Agia Anna, "Nympheon", with its remarkable mosaics and a staircase leading to the Acropolis, Odeon where many statues were found, and "Casa Romana", a mansion from the Roman years, beautifully decorated with frescoes, carved representations and beautiful mosaics. Here one can see Hellenistic gymnasium with the famous "carved street", where the ancient gyms were located.